DARK SUMMER: The Summer Of My Somber Ghost – Schlockmania! Style and atmosphere go a long way in horror films. Even the simplest storyline can become enchanting if handled by a true stylist. This is clearly the approach that director Paul Solet was going for with Dark Summer. It attempts to transcend simple teen horror and ghost story concepts by making a full-court press with its visual style and evoking a very serious mood that is the opposite of your usual Hollywood popcorn horror fare. Unfortunately, the approach only gets the film so far. 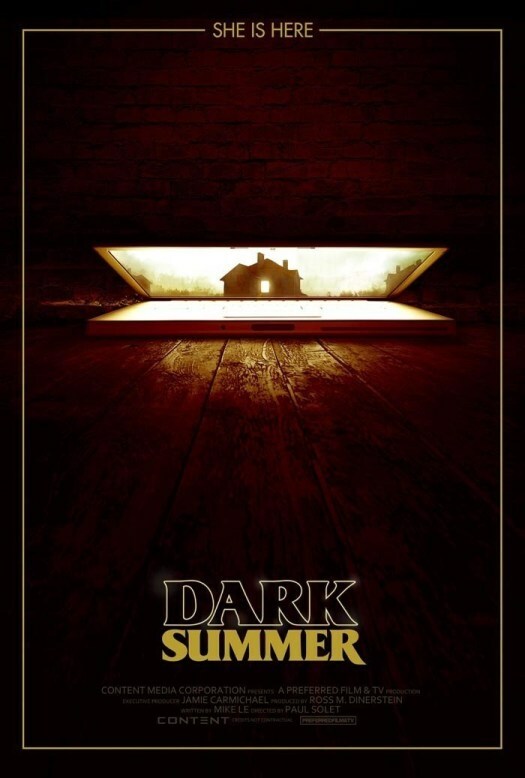 Dark Summer revolves around the travails of Daniel (Keir Gilchrist), a high school kid who is under house arrest, complete with ankle monitor, for breaking into the online accounts of classmate Mona (Grace Phipps). Despite the observation of local cop Stokes (Peter Stormare), Daniel uses his tech smarts to sneak back onto a computer to contact Mona. Unfortunately, when he reaches her via cam she commits suicide. As he’s reeling from this shock, he soon finds himself trapped by Mona’s ghost. He turns to friends Kevin (Maestro Harrell) and Abby (Stella Maeve) for help but Mona is no mood to leave or be interfered with. The results strive hard for a variation on the format but ultimately can’t escape the demands of its genre. Solet takes a gutsy, deliberately paced approach – the real shocks don’t begin until the film’s midpoint – and uses moody, artful camerawork and somber music to build up a melancholy mood. He also gets subtly effective performances from Gilchrist, Maeve and Harrell, all of whom work hard to ground their characterizations in believable teen moodiness. Unfortunately, Dark Summer is so caught up in its mood that it becomes gloomy rather than scary. The slow pace also allows the viewer to concentrate on the shortcomings of Mike Le’s script: despite Gilchrist’s thoughtful performance, the character he plays is written as a mopey, whiny emo type who is hard to sympathize with – and this is a problem because he’s in almost every scene. More importantly, the second half of the film doesn’t offer any fresh variations on the ghost story. Despite Solet’s straining for something different, the film ultimately becomes a conventional spook-show, complete with a gimmicky twist ending that evokes the M. Night Shyamalan school of horror. Simply put, Dark Summer makes a nice try but making a teen ghost story as moody as teenagers themselves doesn’t reinvent the genre. It simply reduces the level of entertainment. Blu-Ray Notes: Scream Factory just issued this title on blu-ray. The transfer does well by the film’s moody, shadow-dominated cinematography. Both 5.1 and 2.0 lossless stereo tracks are offered: the 5.1 track was used for this review and offers a complex mix with a lot of surround effects. A pretty involved package of extras is included. A solo commentary track with Solet focuses on the challenges of creating atmosphere and quality special effects on a budget plus plenty of appreciative material on the cast. A variety of featurettes follow. The shortest deal with Solet and the young cast members, offering 2-minute style EPK pieces on their work in the film. More impressive are a 13-minute piece of the art of the film that deals with production and costume design as well as the cinematography and a 9 minute interview with composer Austin Wintery that allows him to detail how he created the score’s unique sounds. Best of all is a nearly 12 minute chat with Stormare, who touches on everything from the complexity of his role to his thoughts on genre fare and even some Ingmar Bergman stories. A trailer closes things out: it’s a deceptive piece that makes the movie look like a rollercoaster instead of a mood piece. All in all, this is a nice presentation of an indie horror flick with a few interesting extras.